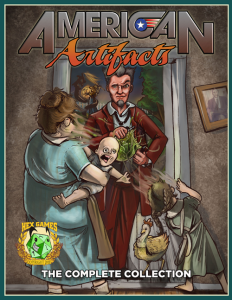 American Artifacts: The Complete Collection gives full descriptions of 66 magical items uniquely suited to the New World. Some are objects from American history, like Crispus Attucks’s musket ball, or from pop culture, like Clint Eastwood’s poncho. Some were created by wizards who act like scientists, and some by scientists who act like wizards; artifacts like William Faulkner’s pocket watch and Nikolai Tesla’s ray gun blur the line between magic and science. All 66 artifacts are suitable for use in a wide variety of games. Each entry includes a description of the artifact, background information, and game mechanics. A detailed timeline is also included, that offers a clear overview of the occult history of America. 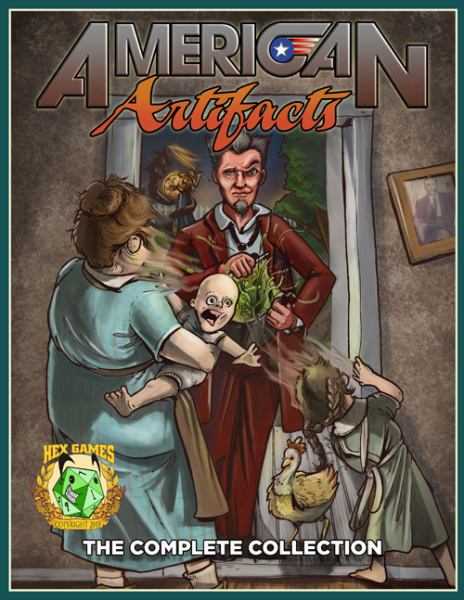 American Artifacts: The Complete Collection–as well as the QAGS rulebook, Hobomancer, the first two American Artifacts books, and more–can be purchased in PDF form at www.hexgames.com and at the finer PDF sales sites for just $10. You can also purchase the print edition from DriveThruRPG or the Hex website for just $19.99.